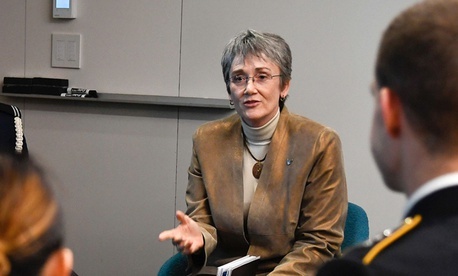 Air Force Secretary Heather Wilson has a new role: chairman of the board. Now that Congress has largely put the services in charge of buying weapons, and removed much of the purview of the Office of the Secretary of Defense, Wilson has put in place a new governing body to oversee hundreds of billions of dollars in purchases. The panel will meet for the first time next week. That board is made up of Wilson; Gen. David Goldfein, the Air Force chief of staff; Undersecretary Matt Donovan; and Will Roper, the service’s assistant secretary for acquisition, technology and logistics. The panel will meet three times a year and receive briefings from a dozen or so program executive officers. Each of those senior acquisition officials oversees numerous projects. Right now, the meetings are dubbed “Air Force Acquisition Day,” which Wilson acknowledges isn’t the best name. “It’s more like a corporate board meeting than it is a small business meeting,” she said. In all, Wilson is now responsible for 465 major programs. Her goal is simple: get capabilities to airmen faster and cheaper. “I want them spending more time managing the programs than managing the Pentagon,” Wilson said. Buying new software is among the items Air Force leaders plan to discuss at next week’s meeting. Another possible agenda item: “how we innovate in sustainment, ” acquisition head Roper said at a briefing last month. Speaking more generally about her plans for changing the way the Air Force buys weapons, Wilson said to expect more prototyping and experimentation, akin to work already being done by Pratt & Whitney and General Electric to build new jet engines. The goal of the project is to increase fuel efficiency by 25 percent and thrust by 10 percent. These new engines could one day replace existing fighter jet engines. “Instead of trying to do an engineering design and sit down with modeling and simulation and all of that for two or three years, which is what the normal acquisition process would do, we contracted with two of the best engine companies in America and said: ‘See what you can build,’” Wilson said. To put the potential savings in perspective, the Air Force plans to spend about $5 billion on fuel this year.